The HTC VIVE is a bit bulkier and heavier VR headset compared to the Oculus Rift, but that does not seem to be a problem when using it. The VIVE headset does not come with headphones attached, so you will need to find a good pair that won’t interfere with the rest of the headset and will be comfortable. Even though the Rift comes with some sort of headphones attached, you’d probably want to detach them and still use a separate headset with it anyway. The only other major difference is the presence of a camera on the front of the HTC Vive, though I have yet to see it in action, in theory it could allow for some nice AR experiences or just to be able to switch to real world view without having to remove the headset. The OLED displays inside both competing products does seem to be pretty much the same – 1200×1080 per eye with a 90 Hz refresh rate, pretty much the same type of lenses and you get about 110 degrees FOV. The end results is pretty much the same in terms of graphics quality and experience, and with the negative side effects minimized for both devices (it is not much harder to get dizzy using the VR headsets). So where is the major difference then? It is in the fact that the HTC Vive currently ships with controllers for each hand of the users while with the Oculus Rift you don’t get these yet and they are supposed to start shipping their touch controllers sometime by the end of the year. The presence or the lack of hand controllers at this point in time pretty much defines major difference. For the moment the Oculus Rift provides more stationary VR experiences where you probably sit in your chair while using the device, while the HTC Vive is focusing on more interactive and “active” action where you move around. Of course when Oculus ships their touch controllers things will probably get similar for both devices, especially when developers see that there is not much point in making exclusive titles for one of the devices with the VR market still so small. The HTC Vive does seem at this point a bit more bothersome to setup and it requires more free space around your computer, so that you will be able to move around freely without hitting obstacles. It comes with two sensors that are used to setup a “working perimeter” and track your movement in the real world and then translate this into virtual world movement. The Oculus Rift currently uses only one sensor, but the touch controllers will come with an additional sensor for better tracking, so setting up things will probably look the same for both with the hand controllers. The HTC Vive controllers do seem a bit large and not so comfortable, while the Oculus touch doe seem to be more compact and it could turn up a more convenient solution, but we’ll have to wait and see. 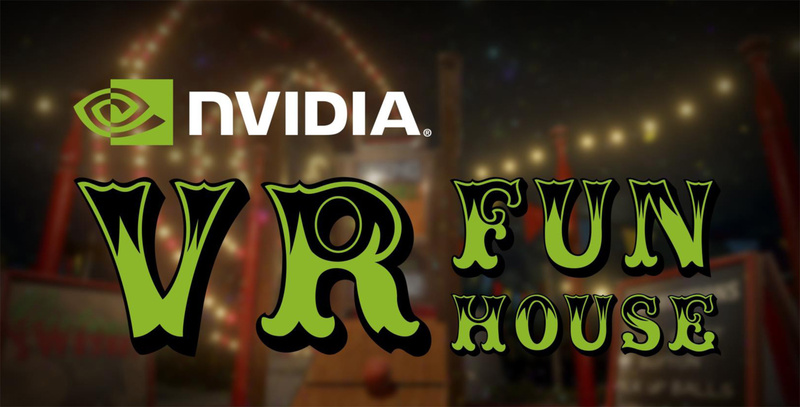 A bit about the Nvidia VR Funhouse demo that I’ve tried. It is a fun little demonstration of the level of interaction in the virtual world that you can achieve and it is Ok as a demonstration, but you probably will not be willing to replay it often. Not that you can since it is not yet publicly available, although it seems that Nvidia will be releasing it as a demo and in the form of a source code as well for developers. The VR Funhouse demo is quit heavy as it employs a lot of Nvidia technologies to make it look and feel as realistic as possible, maybe apart from the graphics that is a bit more cartoon-ish. Still the experience feels quite nice while you run through the various short games that you play inside the demo – hitting stuff, breaking stuff, shooting stuff, throwing stuff. It is easy and fun, though you might replay again some of the first games in order to get the hang of things initially. The only thing that felt a bit weird was the virtual world object placement relative to the hand controllers, in some of the games inside the VR Funhouse the positioning on top of the controllers made it feel a bit weird to get a good feel on where to throw the object exactly. The other demo I’ve also tried, besides the VR Funhouse, was Tilt Btush by Google that lets you paint in 3D space. This was quite impressive when you get the hang of it, though the use of the two touch controllers for choosing tools and colors may need some getting used to. Since this demo also relies on the use of hand controllers it is only available on the HTC Vive, but it will most likely also support Oculus Rift once the touch controllers become available for it as well.